I wish I could say this week at work has been relaxing and you’d think it would be with so many people taking the week off. But oh no, it’s been crazy! I’m so glad it’s a short week, everyone seems stressed and cranky – including me. 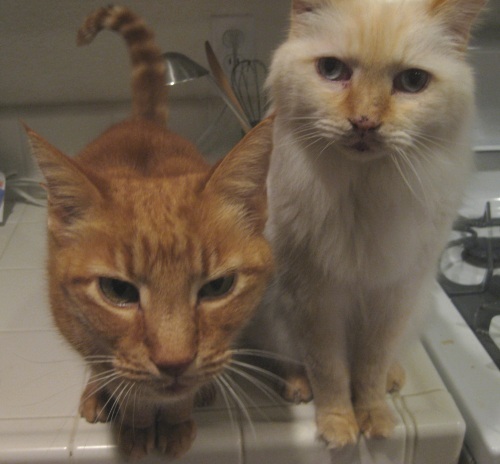 And my mom’s cats who stalked me when I stopped by to pick up my dog. Well they just wanted dinner, but the demands aren’t slowing down! When I got home, I had a demand myself – something sweetish for dinner not demanding much time to create. 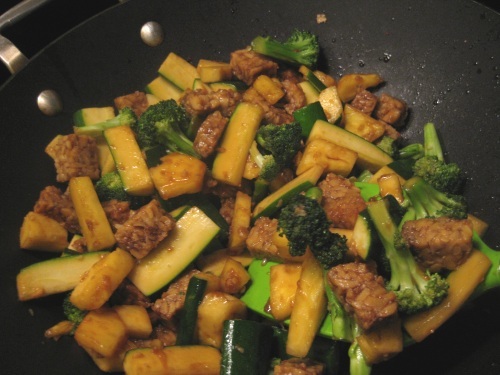 I had fresh pineapple chunks and tempeh and I can never go wrong with a stir fry. Heat oil in a wok over medium heat, saute tempeh and garlic for about 5 minutes. 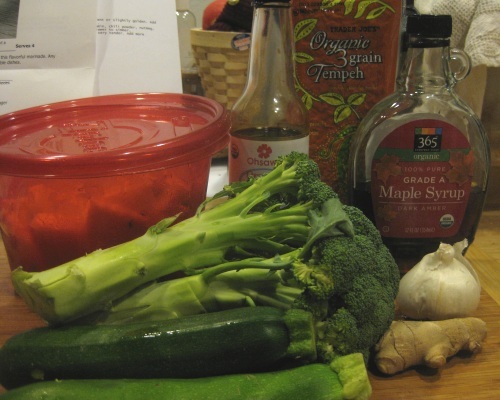 Add broccoli, zucchini, pineapple, ginger, maple syrup and tamari and thoroughly toss. Tempeh chunks will crumble a bit, but that’s okay. Cover and simmer over medium heat for 10 minutes and serve. The sweetness of the pineapple and maple syrup go very well together. I sprinkled some red pepper flakes over it and it was a party of sweet, salty and spicy all working together nicely. For a less demanding dinner, give this fast stir fry a try. I went for a run in freezing cold and rainy conditions last night and it was not as bad as I thought it would be. In fact, I think I run better in chillier temps. My legs and hands did get cold, I need to find better winter running gear because I’m sure it’ll be even worse for the CIM relay coming up. What is your favorite gear for running in the cold? mmmm, I love pineapple in stir-fry!! I wish I knew how to run in the cold, but I have no idea. I’m not looking forward to running when I go home to NY for Christmas! I was super paranoid about running in the cold and put it off as long as possible, but it was refreshing. Make sure you have a headband to cover your ears, the cold air makes mine hurt after too much exposure. Omg this is possibly the best thing Ive seen in ages! I just ate the last of a pineapple i had bought that was on sale. And I should have done a stir fry with it! Red pepp flakes, ginger, pineapple, veggies…YUM! I am gunshy about tamari…i am so sodium-sensitive that soy or tamari are not great for me but gosh, this looks amazing! It was good, but you can swap the tamari with soy sauce and reduce the amount. Cooking with pineapple is fun, I love grilled slices as a summer treat. I definitely run faster in chillier temps– I just want to get it over with! omg that stir fry looks absolutely amazing!!!! I love the sweet and spicy mix! 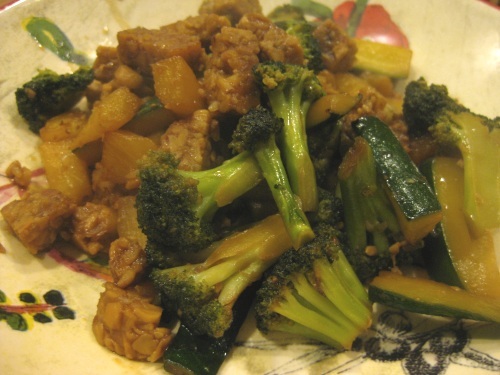 The last (and first) time I tried tempeh I wasn’t a huge fan.. I have to give it a try again though! 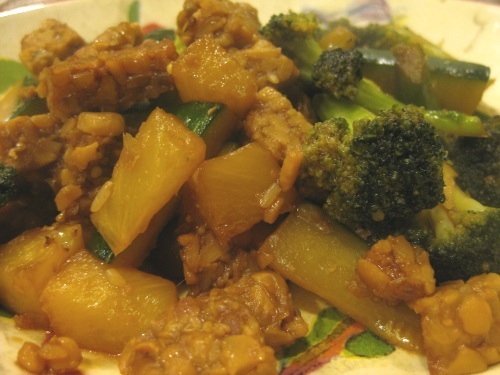 Tempeh was good in this recipe because it crumpled into the mixture softening the texture and absorbing the flavors. It can be a little bland in some recipes. Does this save well in fridge for a few days?? Yes, up to 5 days I’d say.